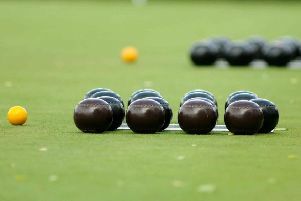 The chopping and changing continued at the top of the Louth Indoor Bowls Club Morning Triples League as Magpies made good their game in hand to hop back to top spot. Their trio of Neil Castle and Martin and Linda Oldfield came good in the latter stages against Dreamers to win 16-8 before Martin and Linda teamed up with Mike Norton to beat Mudlarks 16-10. Magpies had led 6-0 in this game, but fell 9-6 behind before staging a recovery to maintain their unbeaten record. Their main rivals faced each in their only game of the week with Highgate Wanderers’ trio of Brian and Val Sherry with Barry Taylor beating the Yorkies team of Paul Hayman, Tony Powell and Geoff Tyler. They sit second, a point behind the leaders, while Yorkies are now four points off top spot. * Tony Powell enjoyed better fortunes in the Australian Pairs where he and Liz Draper won 22-9 against previously unbeaten Brian Paffey and Chas Dewar to top Group A, two points ahead of their beaten opponents. Brian and Bernice Culham could have moved level on points with the leaders, but lost a very close game against Vic Ball and Mike Norton who did just enough to win 12-6 and leapfrog their opponents into third on shots difference. * There was another top-of-the-table clash between unbeaten pairs in Group B with John Williams and Joan Foster with a 19-11 win over Paul Hayman and Pam Thirde who stood in for Ian Bertram. The winning pair now have a four-point advantage and the second-placed duo have been caught by John Readman and George Chesman who comfortably beat Barry Jordan and Pat Morley 21-5. * The playing surface was due to undergo maintenance work last Friday to remove some inaccuracies. * Next winter’s leagues will be discussed at the committee meeting on June 14 and preparation of the fixtures will begin soon after. Fixtures will be available in late July, and there is still time for new teams to enter the various leagues.